During most Purple Flowers Weeks I tend to put my focus on a lot of traditionally “feminine” fragrances.¹ It’s not because I’m trying to exclude folks that don’t want to smell “pretty”. It’s that a lot of these notes aren’t featured prominently in things other than the stereotypical springtime-fresh bouquet/soliflores. It’s rare to see stuff like lilac or wisteria featured prominently in a fragrance marketed as “masculine”. There are some exceptions. When it comes to iris, you’ll see deep, earthy orris root used in different ways. And then there’s violet. A lot of people think of prim and proper Parma violets or perfumes that smell like French pâtisseries. But, violet has a history of being marketed to both the stereotypical ideals of feminine and masculine. The first being the blossoms and the second being the leaves. 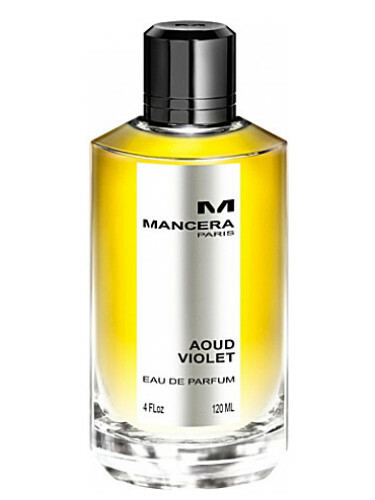 Mancera Aoud Violet is a woodsy violet, a violet for those that may not otherwise pay attention to the note. Aoud Violet opens with dry spices and citrus. There’s also some “motor oil” thing going on. I’m going to tell you why I like Aoud Violet so much. It reminds me of Dior Fahrenheit. There’s this classic masculine “cologne” of spice, citrus and woods but there’s also this weird motor oil and “chlorinated pool” thing/accord going on. As you may already know, I’m a fan of those old school designer masculines. Aoud Violet reminds me of a remix off the themes found in those 70’s-80’s designer masculines. It’s leathery, woodsy and well, strong. It projects like those vintage powerhouse fragrances. Now let’s get to the violet. It’s bitter, green and cool. The violets in these sort of “masculines” tend to always smell like an entire violet was immersed into a bucket of engine oil…or like violets working at an oil change station. Their coolness adds an ozonic touch to this otherwise stout composition. The dry-down of Aoud Violet is moss, patchouli and woods. It’s green but really earthy. There’s a subtle “powderiness” but nowhere near what’s in 99% of violet perfumes. This powderiness is more “barbershop” than anything else. Where’s the oud? I don’t know. Overall, Aoud Violet is a nice woodsy violet. If you’re someone that likes those old-school masculines, I can not recommend Aoud Violet enough. It’s not a period piece. It doesn’t smell 80’s. It’s like an update, like a flanker to that entire era. Notes listed include bergamot, spices, green notes, violet, patchouli, oud, vetiver, amber and moss. Launched in 2014. Give Aoud Violet a try if you like chypres or “masculine” designer fragrances. Or fragrances like Dior Fahrenheit (or any of its flankers), Carven Pour Homme, Creed Green Irish Tweed, OLO Portland Violet/Leather, Jil Sander Simply, CdG Girl and/or Guerlain Chamade Pour Homme. The 4.2 oz bottle retails for $180 at Osswald. Samples are also available for purchase. Victoria’s Final EauPINION – Woodsy violet. I won’t wear it but I love smelling it. ¹Fragrances are for everyone. Wear what you want. Ignore what the bottle says. Ignore where they are displayed in the department store. For the sake of this post, I’m referring to the department store or Sephora model that still slaps a gender on fragrances. Things are changing. But, as we all know, there are still plenty of perfumes being launched as “Homme” or “Femme”. *Sample obtained by me. Product pic from Fragrantica. Rock Hudson pic from drmacro.com. “flanker for an era” might be my new favorite perfume-related jargon…..a great catch-phrase. I also like that you are reviewing a Mancera; I really enjoy a few of their fragrances, and you are right,they project like crazy. I’m avoiding all things aoud right now (burnt out), but this sounds intriguing. Thanks for the review! I haven’t tried many Mancera but the ones that I’ve tried, I love. Of course, I have someone at Osswald basically picking out the ones that I’m going to like for me to try…so far so good! They even have a vanilla that I like. That’s rare for me.